Mark has a rep for going after game and is much in demand with serious anglers and celebrities. Robert DeNiro's been on his boat, as has rapper/actor Will Smith and an assortment of sports stars, rock stars and other big names. Celeb or commoner, the one thing his clients have in common is a desire to match wits with a monster. About 90 percent want to go after game fish, he said. 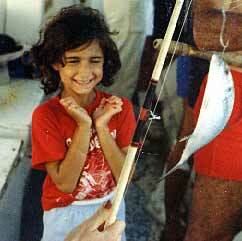 Of those, about half are looking for splashy trophies such as sailfish or marlin. The other half are after sharks. Clients can release or keep their sailfish, he said. The fish aren't endangered and can be eaten. Otherwise, he likes to catch and release anything the angler can't eat and objects to killing a fish just to hang it on the dock and take a picture. Though you can find a charter boat anywhere there's water, the largest fleets are in the Panhandle, particularly Fort Walton Beach and Destin, and the Keys. Destin bills itself as "the luckiest fishing village in the world" and is home to a well-known fishing rodeo. The other advantage over renting a boat and winging it on your own is that the captain knows where to find the fish, which is pretty much the point of the whole outing. to start getting their feet wet. At least he/she should, and that's something you'll want to research before handing over your money, said Ralph Creech, captain of Atlantic Blue Water Charters in Port Canaveral. Check out the captain's website, if there is one, he suggests, and/or "go to the dock a couple days prior and see what theyre bringing in." A boat's daily itinerary usually depends on which fish are running where and the location of the captain's "secret spots." On a recent outing, Creech's clients came back with four 20- to 25-pound gray groupers, a red grouper and four red snappers. On another trip, a company had rented two of his boats. He piloted one, another captain took the other. His boat came back with a haul, the other came back empty of fish and full of grumpy clients. When you catch a food fish -- grouper and snapper are popular -- Krupka and Creech have it cleaned and filleted for you when you get back to shore. You can take it home or to certain restaurants that will cook it for you. Some of Krupka's clients, however, have loftier goals. They see themselves as latter-day Hemingways, wrestling and besting a sailfish. "It's the epitome of sport fishing," Krupka agreed, though most people are happy when they catch anything. Unlike food fish, sailfish and their billfish brethren are always released. Sometimes they're tagged before being put back in the water. Photos make great souvenirs. Or you can take the photo and some measurements to a local taxidermist and have a replica made to impress the folks back home. It's a win-win situation: you get a trophy, the fish gets to live another day. Trophy fishing brings up another issue: the stereotype of deep-sea fishermen is that they're all macho, hard-drinking, Hemingway-wannabes. Truth is slightly different. Yes, males predominate and most enjoy a brewski or three. But women fish, too. So do kids and retirees. Krupka finds that youngsters especially like to catch bait fish, something she does at the beginning of a charter on her way out to the big water. As for females, Krupka finds that they usually come on the boat simply to accompany their menfolk and plan to spend the trip catching rays, not some slimy old fish. Then curiosity -- or maybe coaxing -- gets the better of them and they find themselves reeling in a whopper. From that point on, they're... uh, hooked. On Creech's boat, the boys best watch out. "Women normally outfish the men," he said. Why? "They don't try to muscle the fish," he explained. "You got to go easy on some fish. It's more technique than it is muscle." "I'd rather fish with females," Mark the Shark agrees. "They listen. They make better anglers because they listen to what I tell 'em." No one can guarantee fish, Mark said. Sometimes conditions just aren't right. "That's why they call it 'fishing', not 'catching'," he quipped. Still, deep-sea fishing may not be for the faint of heart or sensitive of stomach. These are big fish -- snapper and grouper routinely run 20 to 50 pounds or more and billfish can be 7 feet long and weigh several hundred pounds -- and they have to be gaffed to be hauled onto the boat. The process can be a little messy, especially in the eyes of those who have trouble killing anything bigger than a mosquito. Krupka makes a point of keeping her operation clean. Fish go "in the box" on ice immediately, she said, and the cockpit, where the fishing takes place, is kept hosed off. In addition to the fun factor, fishing has a serious side: money. The state Fish and Wildlife Commission went hunting for the economic impact of wildlife-related recreation in 2000 and found some big game: when combined, wildlife recreation -- hunting, freshwater fishing, saltwater fishing and wildlife viewing -- generated about $5.5 billion in retail sales. (People frequently participate in more than one category -- anglers can also be wildlife watchers, for instance.) The resulting economic benefit to the state was calculated to be some $7.8 billion. More than 132,000 jobs statewide are directly related to fishing, hunting and wildlife-related recreation. Saltwater angling is the big fish in this statistical pond. More than 2.4 million people participated in the sport, resulting in retail sales of almost $2.4 billion, sales tax of $143.7 million and a total economic impact of almost $4.5 billion. It also provided jobs for nearly 55,000 people. The only activity with more participants was wildlife viewing with 3.9 million, but the related sales and economic impact figures were lower. Nationally, some 76 million Americans over 16 -- that's 40 percent of the population -- enjoyed some form of wildlife-related recreation in 1996, according to a recent study by the U.S. Fish and Wildlife Service. Whatever your economic participation, as long as you got your fish -- or two or three -- the trip was worth the price of admission. You're a serious angler. Now if you could only convince your friends to believe you.